How the local rabbi deals when the neo-Nazis come to town. Rachel Schmelkin is the rabbi educator at Congregation Beth Israel in Charlottesville. Founded in 1882, the building is the oldest synagogue still standing in Virginia. Last weekend, as armed Nazis paraded through the town, 40 congregants prayed inside. As the synagogue’s president, Alan Zimmerman, has written, during Saturday morning services, “three men dressed in fatigues and armed with semi-automatic rifles stood across the street from the temple.” Throughout the congregation’s Sabbath services on Saturday, “parades of Nazis passed our building, shouting, ‘There’s the synagogue!’ followed by chants of ‘Sieg Heil.’ ” Torah scrolls, which are considered the most sacred ritual item in the Jewish faith, were removed from the building to a congregant’s house for safeguarding. The police did not provide an officer to guard the synagogue, so it hired a private security guard for protection. At the end of services, worshippers had to leave through a side door—in groups—because exiting the front door alone appeared to be too dangerous. Community members who were not Jews showed up in solidarity. Dahlia Lithwick: You are, dear Rabbi Rachel, a year or two out of rabbinical school. You have been the rabbi at Beth Israel for a little more than a year. Did anything in your experience prepare you for the events of this past week? Rabbi Rachel Schmelkin: The events of this past weekend were worse than I ever imagined possible, though I am sad to say that this was not the first time I had experienced anti-Semitism. During my senior year of college at Indiana University (winter 2010), Jewish books were desecrated at the library, a brick was thrown through a window at the Chabad house, and a rock through the back window of Hillel. I remember being afraid to place my Chanukiah (candelabrum) in the window that year. The fear I felt then has returned, only much stronger now. But back in 2010, the Jewish community of Bloomington was resilient. We gathered publicly as Jews to celebrate Chanukah, and did not allow ourselves to be overcome by fear. Here in Charlottesville I will do the same. I have, and will continue to find, that courage within myself, and I know that the Jewish community of Charlottesville will stand together with strength. Talk a bit about the clergy that came together, long before the Saturday march. The faith leaders across the city here—their coordination and shared sense of purpose—seems an important and underreported part of the story, especially because even though it was a pretty diverse and complicated group, you all managed to stand together. A dark cloud has hovered over Charlottesville this summer, with an initial torchlight march and a KKK rally in July, but my fellow clergy in Charlottesville have been a source of light. Though we are a diverse group with different ideas about how to respond to the hateful groups that came into town, each of us understood that we had important roles to play. Some took part in nonviolent direct action, others provided pastoral care to people in need, and others led meditation and prayer, creating places where people could feel safe and cared for. And during what was no doubt an extremely busy time for all the clergy in Charlottesville, non-Jewish clergy in the Charlottesville Clergy Collective paid special attention to the Jewish community, even offering to surround our building during Saturday morning Shabbat services to help protect us and be present in solidarity with us. Though we decided to hire private security and encouraged the Charlottesville clergy to be in the many places they needed to be that morning, this beautiful gesture has stayed with me and reminded me that the Jewish community is not alone. 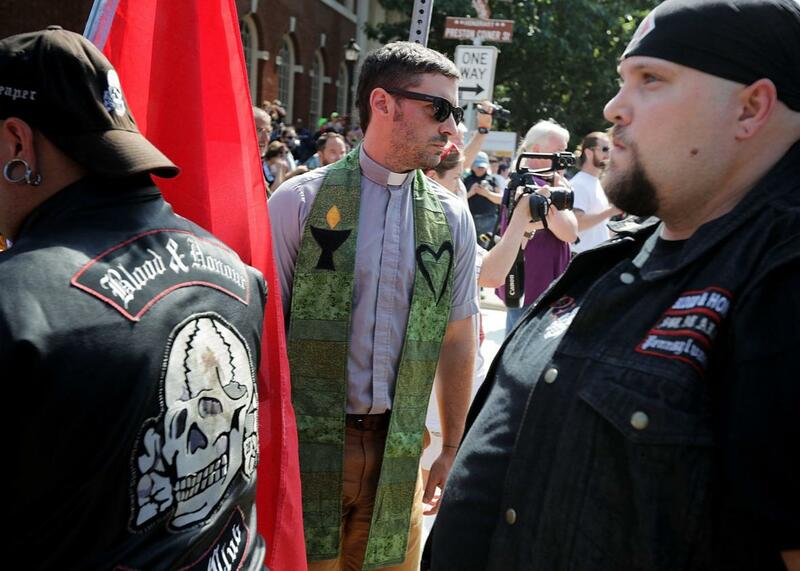 The hate that descended on Charlottesville this summer brought clergy of many faiths together, and the relationships formed this past summer are truly a blessing. And so this brought you to—quite literally—the front lines last Saturday. How did you prepare? Describe what you saw that day. On Saturday, I helped lead an 8 a.m. peaceful march with fellow clergy. We were shouted at along the way. Then I was one of several clergy to station myself at First United Methodist Church. The front steps of the church are directly across from Emancipation Park. I spent several hours playing music and bearing witness to the white supremacist rally in the park. My hope was to drown out the sound of their hate with songs of love, kindness, and peace. The streets of Charlottesville became so violent that day that the church had to initiate several lockdowns, which of course interrupted the music. My Christian clergy friends rushed me inside very quickly each time knowing that I myself could be a target. It still feels surreal that Nazis were rallying in a park literally steps away from me. At one point, a fellow clergy member called saying that he was at the scene of the attack and needed a car to take an injured young woman to the hospital. It just so happens that my husband, Geoff Schmelkin, and I park our cars in the garage across from where the attack occurred. There has been a lot of community controversy around the reports that the police didn’t adequately protect Congregation Beth Israel that morning and that the decision had to be taken to remove the Torah scrolls from the building to hide them in a congregant’s house. Is there anything you want to add to what’s already been reported? When Geoff and I came back from the hospital, I saw a police officer sitting on the corner near the synagogue. I am pleased to say that we have recently spoken with the Charlottesville Police Department about their actions on Aug. 12 and their plans going forward. We feel confident that they will look out for us in the future and that though we may have perceived them as inattentive on the 12th, we were on their radar and they were protecting us. Perception can be different from reality. I have to ask this question, perhaps for selfish reasons, but you have been so deeply connected to the children at Congregation Beth Israel, and many of them are terrified this summer. Some were afraid to come to the congregation’s summer camp this year. We have talked—you and I—about how my own children feel: unsafe, like trash, anxious, they say. What are you telling the kids who suddenly live in a world in which armed Nazis stand outside their sanctuary, calling for Hitler’s work to be finished in 2017? What gives you hope and confidence in this moment? I would tell any of our students who feel afraid that their safety is our number one priority. Synagogue security, especially for our children, is the main thing we are working on at this time. We are committed to making sure that CBI is a place where our children feel the safety and love of community, and that it continues to be a place where they learn the Jewish value to repair our broken world. This education is more important now than ever. This weekend was traumatizing and made many feel that we had gone back in time. But I believe from the bottom of my heart that we have not. We live in a town full of people who are watching out for us and would drop everything to stand by our side [along] with the many other minority groups who also feel traumatized and afraid. *Correction, Aug. 21, 2017: Due to a photo provider error, the photo caption misidentified a Unitarian Universalist minister as a priest.